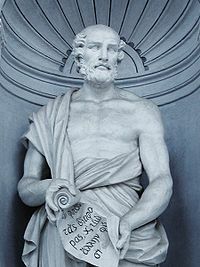 Theophrastus (Greek: Θεόφραστος; c. 371 – c. 287 BC), a Greek native of Eresos in Lesbos, was the successor to Aristotle in the Peripatetic school. He came toAthens at a young age, and initially studied in Plato's school. After Plato's death he attached himself to Aristotle. Aristotle bequeathed to Theophrastus his writings, and designated him as his successor at the Lyceum. Theophrastus presided over the Peripatetic school for thirty-six years, during which time the school flourished greatly. After his death, the Athenians honoured him with a public funeral. His successor as head of the school was Strato of Lampsacus. The interests of Theophrastus were wide-ranging, extending from biology and physics to ethics and metaphysics. His two surviving botanical works, Enquiry into Plantsand On the Causes of Plants, were an important influence on medieval science. There are also surviving works On Moral Characters, On Sensation, On Stones, and fragments on Physics and Metaphysics all written in Greek. In philosophy, he studied grammar and language, and continued Aristotle's work on logic. He also regardedspace as the mere arrangement and position of bodies, time as an accident of motion, and motion as a necessary consequence of all activity. In ethics, he regardedhappiness as depending on external influences as well as on virtue, and famously said that "life is ruled by fortune, not wisdom." Athens Era Ancient philosophy Region Western Philosophy School Peripatetic school Main interests Botany, Ethics, Grammar, History,Logic, Metaphysics, Natural History, PhysicsNotable ideasDeveloped the philosophy of AristotleLifeMost of the biographical information we have of Theophrastus was provided by Diogenes Laërtius' Lives of the Philosophers, written more than four hundred years after Theophrastus' time. He was a native of Eresos in Lesbos. His given name was Tyrtamus (Greek: Τύρταμος), but he later became known by the nickname "Theophrastus," given to him, it is said, by Aristotle to indicate the grace of his conversation (ancient Greek: Θεός = God and φράζειν = to phrase i.e. divine expression). Aristotle, Theophrastus, and Strato of Lampsacus. Part of a fresco in the National University of AthensAfter receiving instruction in philosophy in Lesbos from one Alcippus, he moved to Athens, where he may have studied under Plato. He became friends with Aristotle, and when Plato died (348/7 BC) Theophrastus may have joined Aristotle in his self-imposed exile from Athens. When Aristotle moved to Mytilene on Lesbos in 345/4, it is very likely that he did so at the urging of Theophrastus. It seems that it was on Lesbos that Aristotle and Theophrastus began their research into natural science, with Aristotle studying animals and Theophrastus studying plants. Theophrastus probably accompanied Aristotle to Macedonia when Aristotle was appointed tutor toAlexander the Great in 343/2. Around 335 BC, Theophrastus moved with Aristotle to Athens where Aristotle began teaching in the Lyceum. When, after the death of Alexander, anti-Macedonian feeling forced Aristotle to leave Athens, Theophrastus remained behind as head (scholarch) of the peripatetic school, a position he continued to hold after Aristotle's death in 322/1. WritingsFrom the lists of Diogenes Laërtius, giving 227 titles, it appears that the activity of Theophrastus extended over the whole field of contemporary knowledge. His writing probably differed little from Aristotle's treatment of the same themes, though supplementary in details. Like Aristotle, most of his writings are lost works. Thus Theophrastus, like Aristotle, had composed a first and second Analytic. He had also written books on Topics; on the refutation of fallacies; as well as books on the Principles of Natural Philosophy(Physica Auscultatio), on Heaven, and on Meteorological Phenomena. The work of Theophrastus On Affirmation and Denial seems to have corresponded to that of Aristotle's On Judgment. Frontispiece to the illustrated 1644 edition of the Enquiry into Plants(Historia Plantarum)In addition, he wrote on the Warm and the Cold, on Water, Fire, the Sea, on Coagulation and Melting, on various phenomena of organic and spiritual life, and on the Soul and Sensuous Perception. Likewise we find mention of monographs of Theophrastus on the early Greek philosophers Anaximenes, Anaxagoras, Empedocles,Archelaus, Diogenes of Apollonia, Democritus, which were made use of by Simplicius; and also on Xenocrates, against the Academics, and a sketch of the political doctrine of Plato. That he studied general history, as we see from the quotations in Plutarch's lives of Lycurgus, Solon, Aristides, Pericles, Nicias, Alcibiades,Lysander, Agesilaus, and Demosthenes, which were probably borrowed from the work on Lives. But his main efforts were to continue the labours of Aristotle in natural history. This is testified to not only by a number of treatises on individual subjects of zoology, of which, besides the titles, only fragments remain, but also by his books onStones, his Enquiry into Plants, and On the Causes of Plants, which have come down to us entire. In politics, also, he seems to have trodden in the footsteps of Aristotle. Besides his books on the State, we find quoted various treatises on Education, on Royalty, on the Best State, on Political Morals, and particularly his works on theLaws, one of which, containing a recapitulation of the laws of various barbarian as well as Greek states, was intended to be a companion to Aristotle's outline of Politics, and must have been similar to it. He also wrote on oratory and poetry. Theophrastus, without doubt, departed further from Aristotle in his ethical writings, as also in his metaphysical investigations respecting motion, the soul, and God. Besides these writings, Theophrastus was the author of several collections of problems, out of which some things at least have passed into the Problems that have come down to us under the name of Aristotle, and commentaries, partly dialogues, to which probably belonged the Erotikos, Megacles, Callisthenes, andMegarikos, and letters, partly books on mathematical sciences and their history. Many of his works that we do have exist only in fragmentary form. "The style of these works, as of the botanical books, suggests that, as in the case of Aristotle, what we possess consists of notes for lectures or notes taken of lectures," his translator Arthur Hort remarks. "There is no literary charm; the sentences are mostly compressed and highly elliptical, to the point sometimes of obscurity. The text of these fragments and extracts is often so corrupt that there is a certain plausibility to the well-known story that the works of Aristotle and Theophrastus were allowed to languish in the cellar of Neleus of Scepsis and his descendents. On PlantsCotton ready for harvestBanyan treeThe most important of his books are two large botanical treatises, Enquiry into Plants, and On the Causes of Plants, which constitute the most important contribution to botanical science during antiquity and the Middle Ages, the first systemization of the botanical world; on the strength of these works some call him the "father ofbotany." Cinnamomum verum, fromKöhler's Medicinal Plants, (1887)MyrrhOn the Causes of Plants was originally eight books, of which six survive. It concerns the growth of plants; the influences on their fecundity; the proper times they should be sown and reaped; the methods of preparing the soil, manuring it, and the use of tools; and of the smells, tastes, and properties of many types of plants. The work deals mainly with the economical uses of plants rather than their medicinal uses, although the latter is sometimes mentioned. to the reports of Alexander's followers he owed his accounts of such plants as the cotton-plant, banyan, pepper, cinnamon, myrrh, andfrankincense.Frankincense trees in DhufarTheophrastus' Enquiry into Plants was first published in a Latin translation by Theodore Gaza, at Treviso, 1483; in its original Greek it first appeared from the press of Aldus Manutius at Venice, 1495–98, from a third-rate manuscript, which, like the majority of the manuscripts that were sent to printers' workshops in the fifteenth and sixteenth century, has disappeared. Wimmer identified two manuscripts of first quality, theCodex Urbinas in the Vatican Library, which was not made known to J. G. Schneider, who made the first modern critical edition, 1818–21, and the excerpts in the Codex Parisiensis in the Bibliothèque nationale de France. The CharactersHis book The Characters, if it is indeed his, deserves a separate mention. The work contains thirty brief, vigorous, and trenchant outlines of moral types, which form a most valuable picture of the life of his time, and in fact of human nature in general. They are the first recorded attempt at systematic character writing. The book has been regarded by some as an independent work; others incline to the view that the sketches were written from time to time by Theophrastus, and collected and edited after his death; others, again, regard the Characters as part of a larger systematic work, but the style of the book is against this. Theophrastus has found many imitators in this kind of writing, notably Joseph Hall(1608), Sir Thomas Overbury (1614–16), Bishop Earle (1628), and Jean de La Bruyère (1688), who also translated the Characters. George Eliotalso took inspiration from Theophrastus' Characters, most notably in her book of caricatures, Impressions of Theophrastus Such. Writing the "character sketch" as a scholastic exercise also originated in Theophrastus's typology. On SensationA treatise On Sense Perception and its objects is important for a knowledge of the doctrines of the more ancient Greek philosophers regarding the subject. A paraphrase and commentary on this work was written by Priscian of Lydia in the sixth century. With this type of work we may connect the fragments on Smells, on Fatigue, on Dizziness, on Sweat, on Swooning, on Palsy, and on Honey. PhysicsWe also possess in fragments a History of Physics. To this class of work belong the still extant sections on Fire, on the Winds, and on the signs of Waters, Winds, and Storms. Various smaller scientific fragments have been collected in the editions of Johann Gottlob Schneider (1818–21) and Friedrich Wimmer (1842—62) and in Hermann Usener's Analecta Theophrastea. MetaphysicsThe Metaphysics (nine chapters) was considered a fragment of a larger work by Usener in his edition (Theophrastos Metaphysica, Bonn, 1890), but according to Ross and Fobes in their edition (TheophrastusMetaphysica, Oxford, 1929), the treatise is complete (p. X) and this opinion is now widely accepted. There is no reason for assigning this work to some other author because it is not noticed in Hermippus andAndronicus, especially as Nicolaus of Damascus had already mentioned it. On StonesCut emeraldsBaltic amber necklaceWe possess a treatise On Stones, in which Theophrastus classified rocks based on their behavior when heated, further grouping minerals by common properties, such as amber and magnetite, which both have the power of attraction. He also comments on the effect of heat on minerals and their different hardnesses. He describes different marbles; mentions coal, which he says is used for heating by metal-workers; describes the various metal ores; and knew that pumice-stones had a volcanic origin. He also deals with precious stones, emeralds, amethysts, onyx, jasper, etc., and describes a variety of "sapphire" that was blue with veins of gold, and thus was presumably lapis-lazuli. Lapis lazuli.He knew that pearls came from shell-fish, that coral came from India, and speaks of the fossilized remains of organic life.Theophrastus made the first known reference to the phenomenon of pyroelectricity, noting that the mineral tourmaline becomes charged when heated. He also considers the practical uses of various stones, such as the minerals necessary for the manufacture of glass; for the production of various pigments of paint such as ochre; and for the manufacture of plaster. He discusses the use of the touchstone for assaying gold and gold alloys, an important property which would require the genius of Archimedes to resolve in quantitative detail when he was asked to investigate the suspected debasement of a crown a few years later. Bi-colored tourmalinecrystal.Many of the rarer minerals were found in mines, and he mentions the famous copper mines of Cyprus and the even more famous silver mines, presumably of Laurium near Athens, and upon which the wealth of the city was based, as well as referring to gold mines. The Laurium silver mines, which were the property of the state, were usually leased for a fixed sum and a percentage on the working. Towards the end of the fifth century the output fell, partly owing to the Spartan occupation of Decelea. But the mines continued to be worked, though Strabo records that in his time the tailings were being worked over, and Pausanias speaks of the mines as a thing of the past. The ancient workings, consisting of shafts and galleries for excavating the ore, and washing tables for extracting the metal, may still be seen. Theophrastus wrote a separate work On Mining, which like most of his writings is a lost work. Pliny the Elder makes clear references to his use of On Stones in his Naturalis Historia of 77 AD, while updating and making much new information available on minerals himself. Although Pliny's treatment of the subject is more extensive, Theophrastus is more systematic and his work is comparatively free from fable and magic. From both of these early texts was to emerge the science of mineralogy, and ultimately geology. Pliny is especially observant on crystal habit and mineral hardness, for example. PhilosophyTheophrastus, depicted as a medieval scholar in the Nuremberg ChronicleThe extent to which Theophrastus followed Aristotle's doctrines, or defined them more accurately, or conceived them in a different form, and what additional structures of thought he placed upon them, can only be partially determined because of the loss of so many of his writings. Many of his opinions have to be reconstructed from the works of later writers such as Alexander of Aphrodisias and Simplicius. LogicTheophrastus seems to have carried out still further the grammatical foundation of logic and rhetoric, since in his book on the elements of speech, he distinguished the main parts of speech from the subordinate parts, and also direct expressions (kuria lexis) from metaphorical expressions, and dealt with the emotions (pathe) of speech. He further distinguished a twofold reference of speech (schisis) to things (pragmata) and to the hearers, and referred poetry and rhetoric to the latter. He wrote at length on the unity of judgment, on the different kinds of negation, and on the difference between unconditional and conditional necessity. In his doctrine of syllogisms he brought forward the proof for the conversion of universal affirmative judgments, differed from Aristotle here and there in the laying down and arranging the modiof the syllogisms, partly in the proof of them, partly in the doctrine of mixture, i.e. of the influence of the modality of the premises upon the modality of the conclusion. Then in two separate works he dealt with the reduction of arguments to the syllogistic form and on the resolution of them; and further, with hypothetical conclusions. For the doctrine of proof, Galen quotes the second Analytic of Theophrastus, in conjunction with that of Aristotle, as the best treatises on that doctrine. In different monographs he seems to have tried to expand it into a general theory of science. To this too may have belonged the proposition quoted from his Topics, that theprinciples of opposites are themselves opposed, and cannot be deduced from one and the same higher genus. For the rest, some minor deviations from the Aristotelian definitions are quoted from the Topica of Theophrastus. Closely connected with this treatise was that upon ambiguous words or ideas, which, without doubt, corresponded to book E of Aristotle's Metaphysics. Physics and metaphysicsTheophrastus introduced his Physics with the proof that all natural existence, being corporeal and composite, requires principles, and first and foremost, motion, as the basis of all change. Denying the substance of space, he seems to have regarded it, in opposition to Aristotle, as the mere arrangement and position (taxis and thesis) of bodies. Time he called an accident of motion, without, it seems, viewing it, with Aristotle, as the numerical determinant of motion. He attacked the doctrine of the four classical elements and challenged whether fire could be called a primary element when it appears to be compound, requiring, as it does, another material for its own nutriment. Surely, then, if the life in animals does not need explanation or is to be explained only in this way, may it not be the case that in the heavens too, and in the heavenly bodies, movement does not need explanation or is to be explained in a special way?—Theophrastus, Metaphysics, 10a.16-29He recognised no activity without motion, and so referred all activities of the soul to motion: the desires and emotions to corporeal motion, judgment (kriseis) and contemplation to spiritual motion. The idea of a spirit entirely independent of organic activity, must therefore have appeared to him very doubtful; yet he appears to have contented himself with developing his doubts and difficulties on the point, without positively rejecting it. Other Peripatetics, like Dicaearchus, Aristoxenus, and especially Strato, developed further thisnaturalism in Aristotelian doctrine. With regard to the view that all things are for the sake of an end and nothing is in vain, the assignation of ends is in general not easy, as it is usually stated to be ... we must set certain limits to purposiveness and to the effort after the best, and not assert it to exist in all cases without qualification.—Theophrastus, Metaphysics, 10a.22-24, 11a.1-3He did not follow the incessant attempts by Aristotle to refer phenomena to their ultimate foundations, or his attempts to unfold the internal connections between the latter, and between them and phenomena. In antiquity, it was a subject of complaint that Theophrastus had not expressed himself with precision and consistency respecting God, and had understood it at one time as Heaven, at another an (enlivening) breath (pneuma). EthicsTheophrastus did not allow a happiness resting merely upon virtue, or, consequently, to hold fast by the unconditional value of morality. He subordinated moral requirements to the advantage at least of a friend, and had allowed in prosperity the existence of an influence injurious to them. In later times, fault was found with his expression in the Callisthenes, "life is ruled by fortune, not wisdom," (Latin: vitam regit fortuna non sapientia). That in the definition of pleasure, likewise, he did not coincide with Aristotle, seems to be indicated by the titles of two of his writings, one of which dealt with pleasure generally, the other with pleasure as Aristotle had defined it. Although, like his teacher, he preferred contemplative (theoretical), to active (practical) life, he preferred to set the latter free from the restraints of family life, etc. in a manner of which Aristotle would not have approved. The bust inscribed "Theophrastos Melanta Eresios"Theophrastus was opposed to eating meat on the grounds that it robbed animals of life and was therefore unjust. Non-human animals, he said, can reason, sense, and feel just as human beings do. The "portrait" of TheophrastusThe marble herm figure with the bearded head of philosopher type, bearing the explicit inscription, must be taken as purely conventional. Unidentified portrait heads did not find a ready market in post-Renaissance Rome. This bust was formerly in the collection of marchese Pietro Massimi at Palazzo Massimi and belonged to marchese L. Massimi at the time the engraving was made. It is now in the Villa Albani, Rome (inv. 1034). The inscribed bust has often been illustrated in engravings and photographs: a photograph of it forms the frontispiece to the Loeb Classical Library Theophrastus: Enquiry into Plants vol. I, 1916. André Thevet illustrated in his iconographic compendium, Les vraies Pourtrats et vies des Hommes Illustres (Paris, 1584), an alleged portrait plagiarized from the bust, supporting his fraud with the invented tale that he had obtained it from the library of a Greek in Cyprus and that he had seen a confirming bust in the ruins of Antioch. ^ a b c d e Theophrastus (1916). Hort AF (transl.). ed. Theophrastus: Enquiry into Plants. 1, Book I-V. New York: Loeb Classical Library/G.P. Putnam's Sons. ^ a b c d e f g This article incorporates text from a publication now in the public domain: Chisholm, Hugh, ed (1911). "Theophrastus". Encyclopædia Britannica(11th ed.). Cambridge University Press. ^ Cicero, Tusculanae Quaestiones, iii. 28 ; Jerome, Epist. ad Nepotian; Diogenes Laërtius, v. 41. ^ Diogenes Laërtius, v. 42, 50, 47. ^ Diogenes Laërtius, v. 47, 48. ^ a b c d e f g This article incorporates text from the public domain Dictionary of Greek and Roman Biography and Mythology by William Smith (1870). ^ Probably out of the fourth book of the Meteorology of Theophrastus: see Plutarch,Quaest. Gr, vii. ^ "Since 'unknown portraits' were not valued highly, identifying inscriptions were often added to classical portraits by antiquaries and collectors before modern scholarship condemned the practice", notes Eugene Dwyer, "André Thevet and Fulvio Orsini: The Beginnings of the Modern Tradition of Classical Portrait Iconography", The Art Bulletin 75.3 (September 1993: 467-480) p 478 note 65..
^ Dwyer notes Statius pl. xiii; Galle pl. 143; Bellori pl. 38; Gronovius, vol. II p. 92; Visconti, 180-83 pl. xxi, 1-2. ^ Thevet, ch. 31; Eugene Dwyer ("André Thevet and Fulvio Orsini: The Beginnings of the Modern Tradition of Classical Portrait Iconography", The Art Bulletin 75.3 (September 1993: 467-480) pp 476) notes that it had been illustrated by Fulvio Orsini in his Imagines et elogia virorum illustrium (Rome, 1569), "the first critical collection of ancient portraiture" (p. 468). ^ Noted by Eugene Dwyer, "André Thevet and Fulvio Orsini: The Beginnings of the Modern Tradition of Classical Portrait Iconography", The Art Bulletin 75.3 (September 1993: 467-480) pp 476f and p 478 figs 15 and 16.